We all have friends that we can count on for everything. From picking us up when we are down to the "can I borrow...." Its the old cliche, "someone to call at 4 am".... and honestly, I have been the receiver of that, so I know all about it! . There are friends that truly we do not get the chance to see that often, but the occasional email or FB message to keep in touch. I wanted to make some cards that just told them that no matter where they are, or how much we contact one another, they truly are a fabulous friend. 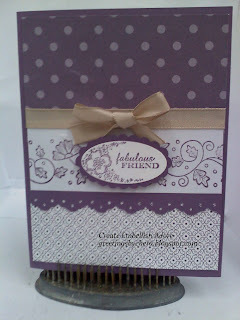 The card is using Lovely Lilac... ok ladies out there - what color do you NOT give attention to lately? This one is mine! Its soothing and pretty, and can be dressed up or down, but all that aside, it sits in the cabinet barely getting much deserved attention! TELL ME... what is your "least" used Color? ?